MASSIVE VOODOO: What is Massive Voodoo? about the passion of miniature painting and sculpting. The blog recently celebrated its 5th Birthday - read more about it here! What is this so called "Miniature Painting"
If you never heard about this passion before let us explain it to you in some words. It is exactly what the name is telling. We paint and sculpt miniature figures. Some of them are bigger in scale than others, but compared to full-size statues they are all very small. They are painted with small, detail brushes, use colours from rather small pots and use small tools to do conversion and sculpting work in this tiny size. We create those small figures, guided by our imagination and inspiration - unique for every project. Unique, because the people who paint or sculpt their miniatures are individual characters, applying their own techniques, having unique styles and different taste and sense of colours. In short, painting or sculpting a miniature is a very unique way of expression of the person behind the figure. How big are those Miniatures? In the following example you can see different scaled models compared to an adult human hand. This hopefully gives a good idea on how big they are. Some are more miniature than others, but in the end all of them are small. 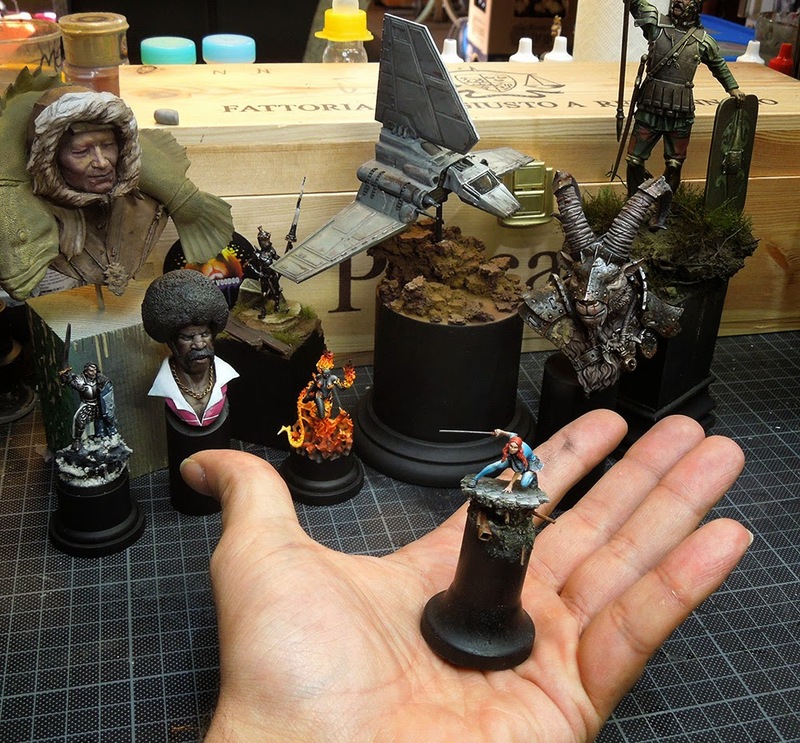 Massive Voodoo's aim is to inspire people to have the most fun while enjoying the passion of miniature painting. We also want to reach people who are not yet even knowing about the beauty of this little miniature world and as long as we can hold a brush we will continue to do so. Those small figures and the worlds you can create around them bring so much joy. The MassiveVoodoo-blog itself takes readers from around the globe on a daily journey full of inspiration, fun and happiness connected to miniature painting, scale modelling or miniature sculpting. Like in a dairy free Articles, hobby material and miniature reviews, event reports, painting classes and private coachings, creative and funny competitions, fascinating Interviews, Work-in-Progress-reports and more are dropping in on a regular basis since 2009. "I appreciate both the Historical and Fantasy sides of the art we all create (I work in both areas and love them both) but it seems to me the new driving force in creativity in the world of miniatures is coming from the enthusiasm in Fantasy and Massive Voodoo is front and center......"
"Keep up the amazing work and I love the tutorials you guys put out, since it inspires all painters around the world to improve and strive for better painting skills!" "I only started painting about two years ago, and your blog has been a massive inspiration. I have learned so much from it that in many ways, the massive voodoo blog is my teacher in painting." "Hello Roman, I've been a fan of you and the Massive Voodoo team. I've been reading a lot of your blog's articles and I have learned a lot of stuff that influence my current painting skills. You and the MV team inspire lots of miniature painter around the world especially our small growing community here in the Philippines." "I also wanted to say thank you for your blog, I had a twenty five year break from miniatures ( Since the Golden Demon 1989!! ), and it was massive voodoo that pulled me back into my passion for miniature art, thank you." "I read you everyday, I became addict to your philosophy. I can just encourage you to keep the same motivation. Everything you do is made by heart. Massive Voodoo has transformed the miniature world, and it transformed the life." "I read your Blog every week since years. In all my devices is a bookmark to MV and I can't count the miniatures I painted with the inspiration I found here. Sometimes its like reading painting-stories from long friends although we never met (except Roman and Raffa on a workshop). Anyway thanks for this Blog!" "Hey Roman, I'm happy to say I walked away with 3 gold coins and a silver! I was even told that in 2 categories it came down to me and one other person for best in category! I'm am so stoked! I just wanted to say thanks! You critique and input helped a lot as did all the wonderful articles and post on Massive Voodoo. Thank you to the MV team for doing so much! Happy Painting!" "I would like to thank you for your work, soooo insane, very inspirational ! A real pleasure to read your articles ! Keep on painting dude!" You want to tell us your oppinion about MASSIVE VOODOO too? Well, tell hit the comments on this post and make your voice be heard. We thank you for your encouraging words now and those we recieved in the past. Your feedback keeps us motivated to bring you daily jungle happiness and keep on going. If you like what we are doing on your Massive Voodoo blog and you want support us check this link. The MASSIVE VOODOO blog is also meant to be the jungle where the Massive Voodoo Team, friends in their passion and in real life share their thoughts, ideas, inspiration, experiences and friendship. A place of home and a place used as a speaking tube for those individuals, a place to introduce their ideas and finished projects. Those friends form the MV-Team, a collective of male and female apes who met because of this beautiful passion and become Monkeybrothers and -sisters. 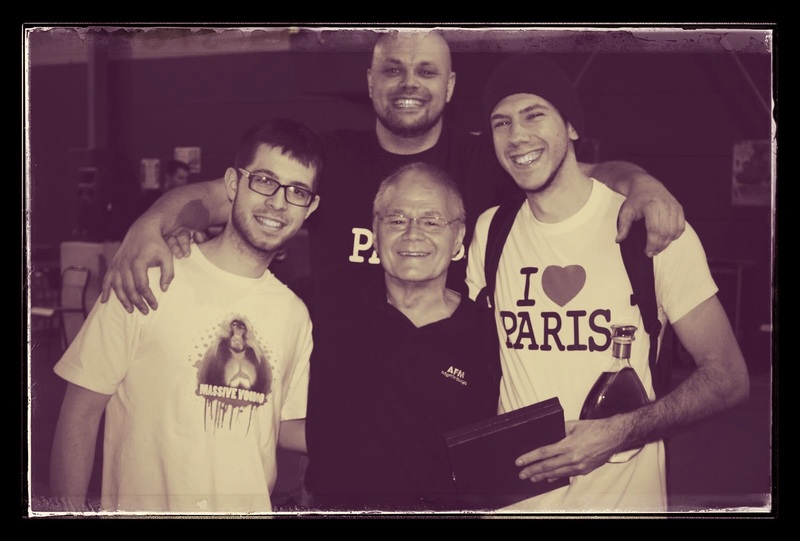 Who travel the so far known world to spread the word about happy miniature painting, meet new and old painting friends on different events and enjoy the beautiful, kind and passionate love that is surrounding our beloved hobby. The blog was founded by Roman in September 2009 with this initial posting. He felt lonely pretty quick and asked his friends to join the Massive Voodoo Team. The call was answered and the monkey-gang grew over the last couple of years. The Massive Voodoo Team consists of the following monkeys. We have two categories, active members regulary posting and/or working on the blog and members that are part of Massive Voodoo as friends that post on MV from time to time. BUT... Massive Voodoo is not only the blog, the team or the miniatures. Massive Voodoo is mainly formed by the readers of our blog and and friends who support us, take their time to read the blog, enjoy the fun we spread and believe in us. In fact you - yes, you - you are also a part of the big Massive Voodoo family that spreads the word worldwide about happy miniature painting. The Jungle Painter family! The Team of MV is put together from very different persons, living in different towns and countries. Some are close to eachother, others live far away from eachother. Soon there will be more information about the team members in seperate introductions by each of the individuals. Why monkeys, apes and bananas? Well, a cage full of monkeys is nothing against these individuals put together, they are way too often just wasting time. There are 13 Kommentare for What is Massive Voodoo? That starwars imperial shuttle, what model is that? is that from X-wing? So, there is no actual Voodoo being practiced? I feel mislead :P Keep up the great work! I love the star wars ship!!! Is from X-wing game? No Voodoo? But Voodoo you do? Do you Voodoo? Yes it is from the X-Wing Game. Long live the Massive Voodoo!! A must on if you love this world. Do you have some more pictures of it? Or some WIP pictures? I would like to start repainting some of the Starwars models myself and i would love to pick your minds on how to do it. Hola,lo primero darle la en hora buena por sus trabajos son increíbles!! Lo siguiente presentarme soy Antonio Ramirez Escultor de figuras de humor me gustaría enseñaros mi trabajo por si os interesara mis figuras de humor y si fuese así por supuesto todas mis figuras para vosotros estarían rebajadas un 25% .Sin mas un cordial saludo. Hello, first give the big time for his work are amazing !! Fantastic blog! Really love the in depth tutorials on therories of painting. I've been painting just as a hobby in the past, and am now looking to expand my skills to take my models to the next level. Love reading your blog, thanks for sharing your knowledge! Arrigato for your kind words, Emma!